Complete Your PADI Open Water Diver Course With Us! A DSMB or “Delayed Surface Marker Buoy” is a surface marker buoy carried by the diver and is deployed at some point during a dive to mark the position of the diver to surface craft. The DSMB is usually a sausage shaped buoy which is kept deflated and rolled up ready for use with a reel of nylon line. Basic open ended DSMBs are cheap and readily available and they are their best attributes. If not inflated properly they can fall over and deflate on the surface and then drop back down towards the diver presenting an entanglement hazard as the nylon line drops with the buoy. Open ended DSMBs with a restrictor are the most common in use. The restriction is usually a narrowing in the buoy about 6 inches above the open end. As the buoy inflates due to the air expanding inside during its ascent, the restriction causes the end of the buoy to close over, a clever little trick that prevents the buoy deflating if it falls over at the surface. Other methods adopted by manufacturers can include thin lead strips in the open end which drop down and seal the tube if the buoy falls over. Open ended tube with restriction and 0.1L air cylinder are quite expensive due to the need for a cylinder and valve but allow for very easy inflation but must be used with care. There are two main arguments about when to deploy a DSMB, deep or shallow! Assuming you have made a good ascent to your stop depth, if you then deploy a DSMB you run the risk of losing buoyancy as you are distracted by the task resulting in an unwanted descent or ascent. Deploying a DSMB mid water gives you only one option if the reel jams:- let go of it or risk being dragged up by it. The inflation method depends on the DSMB. Firstly unclip the buoy and open it out. Using one of the inflation methods add just enough air to get the buoy to stand vertical in the water. Basic open ended buoys can be inflated directly from the alternate air source (Octo) or by using the exhaled air from the divers primary reg. In either case care should be taken not to get either reg tangled in the DSMB line or the reel mechanism. The exhalation method initially has little effect on buoyancy as air exhaled is captured in the buoy. Subsequent exhalations into the buoy will make the diver slightly positively buoyant upon each breath. It is important with either method not to delay in the process otherwise buoyancy adjustment will be necessary and this can be tricky with hands full of reel and regs. DSMBs with their own air cylinders are much easier to inflate. Open the valve until sufficient air is added dependent upon depth and then close the valve just before releasing the buoy. This very important. If the valve is left open the cylinder will empty and this will allow water to enter the cylinder and will lead to internal corrosion which could cause the cylinder to fail during refilling! DSMBs using single use CO2 cartridges are generally sealed buoys. The diver merely has to unroll the DSMB and then pull a toggle to fire the cartridge and inflate the buoy. The cartridge volume is matched to the size of the buoy so it is fully inflated at the surface. Once inflated the diver has no option other than to release the DSMB so it is essential that the diver makes sure there are no overhead hazards before inflation. Reels differ in operation from ratchet reels to simple finger reels. Make sure you know how the reel works, practice on land and then in shallow water first. Be prepared to let go of the reel if needs be! The diver starts a normal swimming ascent once any slack in the DSMB line is taken up by winding the reel. The line is wound in as the ascent progresses. It is useful to remain slightly negatively buoyant to retain slight tension on the DSMB line during the ascent and any safety / decompression stops. 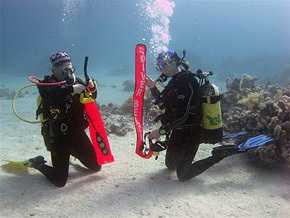 Once the diver is familiar with the particular reel in use the rate of reel ratchet clicks or turns can be used to complement the ascent rate indicator on a dive computer. Care should be taken not to outrun the reel and have loose line floating about due to the chances of becoming entangled. Never clip your reel on while deploying a DSMB. Do not hesitate in dropping the reel if it gets jammed. Make sure the equipment you use is suitable. Penetration reels are not for attaching to DSMBs. Always make sure you have practiced in the shallows and you are completely capable and confident of the technique before using it at depth.